“You shouldn’t eat anything from a farm you don’t like to visit,” says Arthur Upshur. He and Carol Merten Upshur have a farm worth visiting again and again. 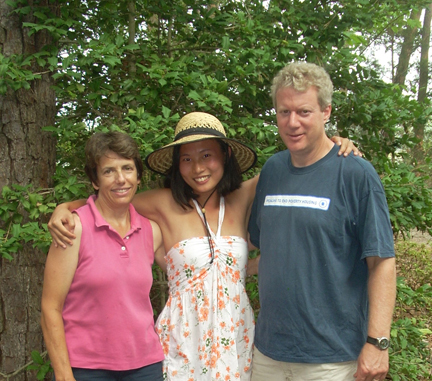 Jennifer Trinh ’11 (center), enjoyed working on Copper Cricket Farm with owners Arthur and Carol Merten Upshur last summer. 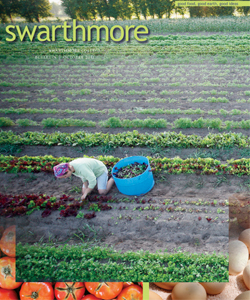 “This is a longtime dream,” says Arthur of the small organic farm he and Carol created four years ago on a neck of land stretching from the town of Machipongo, Va., into the Chesapeake Bay. 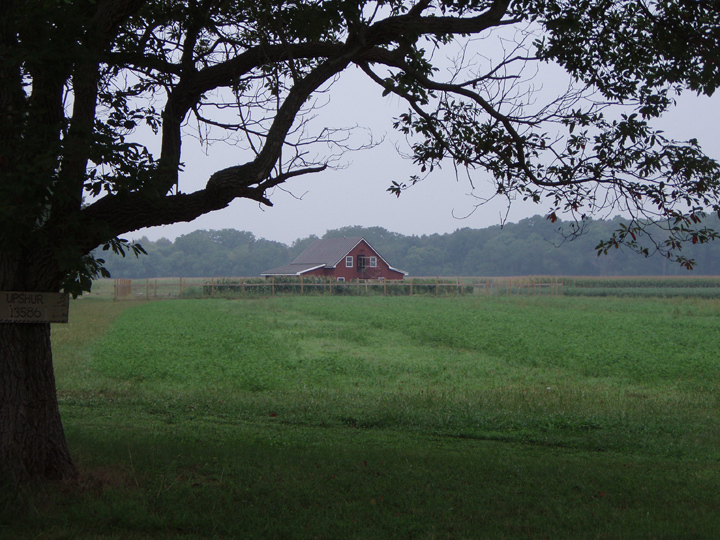 A 1.5-acre vegetable garden and another 6.5 acres of hay, which they cut and bail for mulch, is the extent of their working farm. But their community supported agriculture (CSA) business now supplies 45 families in the region with fresh, chemical-free produce. They named their business Copper Cricket Farm—a conflation of Arthur’s nickname “Cricket” and the surname of their business partners and neighbors, Bob and Melody Copper. Bob works across the Bay in Virginia Beach during the week, but helps on weekends. Melody is a schoolteacher and works on the farm all summer. To get to Copper Cricket Farm, visitors turn off the main highway and travel to the end of a gravel road called Solitude Trail, where the first thing they see is the red New England–style barn the Upshurs built by hand using their own fallen trees and donated wood and other scrap materials—with lots of neighborly advice. In the foreground is the garden, surrounded by a tall, sturdy fence of wire and wood to keep out deer, rabbits, and other pesky critters. In the background are golden fields of hay. Each week, the farm delivers to their lucky subscribers’ overflowing crates—made by hand from scrap wood and gorgeously arranged—of freshly picked flowers and herbs and every kind of vegetable imaginable. Depending upon the season, there are wild raspberries and blackberries from bushes along the wooded path from the gardens to the Upshur homestead, which overlooks the great mouth of a creek that empties into the Chesapeake. Here, the Upshurs raise oysters and hunt for crabs. With their children Elizabeth ’07, Raleigh, and Mary Alice ’12, the Upshurs have been coming to this place every summer since they bought the house in 1994. “Our kids’ childhood memories are of coming down here and playing on the water,” Arthur says. The couple is passionate about good food. Arthur likes to say “you shouldn’t eat anything from a farm you don’t like to visit.” Jennifer Trinh ’11, who interned on the farm this summer, says the food was so good she was afraid she’d suffer withdrawal when she left for graduate school at the University of Santa Cruz in the fall. Jen and fellow intern Tilly Philbrick (Tufts ’11) spent many a morning stretched out alongside a 50-foot row of tender young plants (Carol says they’ve found that 50 feet is a nice, manageable length for a morning’s weeding or debugging) feeling for bugs, then squishing them—not an easy chore for a confirmed vegetarian. It’s the same kind of quiet joy that inspires the Upshurs, who rise every morning at 5, happily planning the day’s work and baking the bread that will serve as the foundation for delectable meals from the day’s harvest. Most days they work until dark. They farm intensively and strategically, practicing crop rotation and companion planting. They compost and use drip irrigation, with taps on timers at the end of each bed. They weed by hand, endlessly. But for all their care, the work of a farmer is vulnerable—to drought and storm, to plagues of insects. Last spring, they lost every squash plant they’d grown to an explosion of squash bugs and cucumber beetles.